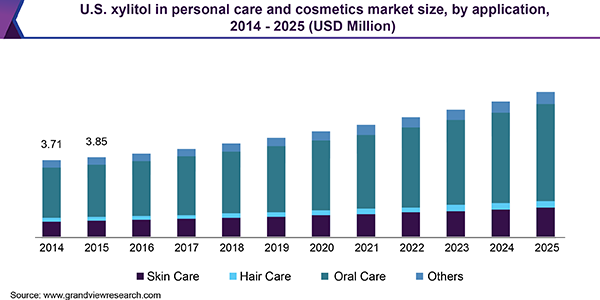 Xylitol in Personal Care & Cosmetics Market Driven By Growing Demand For Oral Care Products Till 2025: Grand View Research Inc. According to report published by Grand View Research, Increasing consumer awareness regarding the health benefits of xylitol in cosmetics and personal care products is likely to drive the Xylitol in Personal Care & Cosmetics market over the forecast period. According to a report,“Xylitol in Personal Care and Cosmetics Market Size, Share & Trends Analysis Report By Application (Skin, Hair, Oral), By Region (Asia Pacific, North America), And Segment Forecasts, 2018 – 2025”, published by Grand View Research, Inc., the global xylitol in personal care and cosmetics market size is expected to reach USD 48.8 million by 2025. It is anticipated to expand at a CAGR of 6.0% over the forecast period. 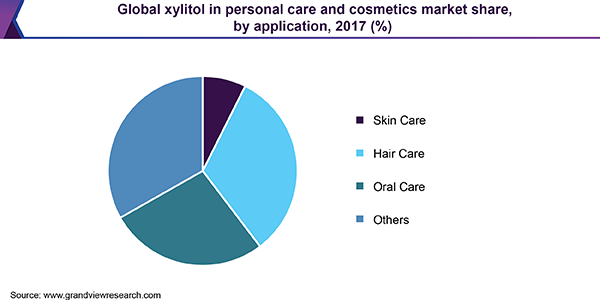 Increasing consumer awareness regarding the health benefits of xylitol in cosmetics and personal care products is likely to drive the market over the forecast period. Natural Food Colors Market: Growing concerns regarding the health hazards associated with synthetic and natural identical colors is expected to drive the demand for the product over the next nine years. Carotenoids Market: The growing application in human food, animal feed, dietary supplements, medicines, and cosmetic application owing to the presence of essential nutrients and vitamins in carotenoids will drive growth over the upcoming years.